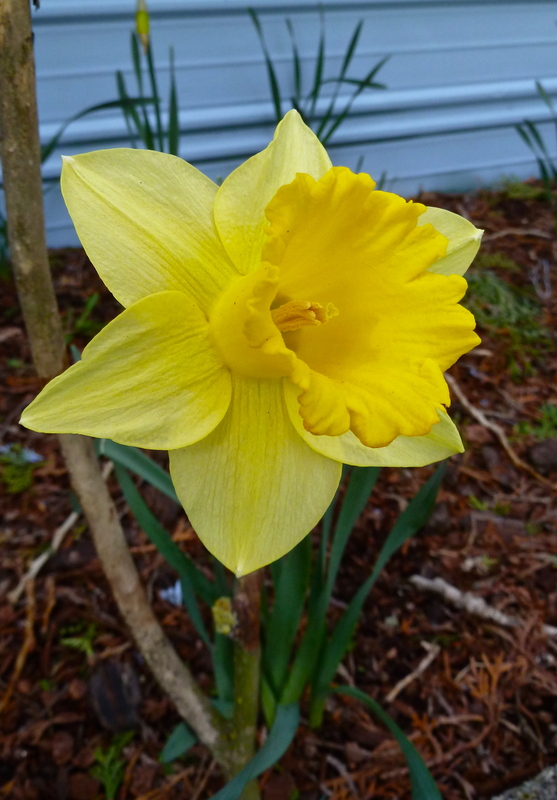 In the last few days, this pretty daffodil, along with a few others, has shown its pretty face to the sun. It sits out in front of our home where the sun doesn’t reach very well. So, when they are open, they keep stretching their little hearts out trying to reach the sun. Because of that, they are leaning close to the ground trying to get even the least little bit of sunshine. So today, I went out and gave this little flower a boost to help it stand tall. I added a stick support to it so that it isn’t so weak. Since it was my first one, I wanted to cut it and bring it inside but just couldn’t bring myself to do that. I love seeing it shining so pretty when I drive up to the house. What came to mind for me when I was looking this morning at the daffodil is what a valuable lesson we can learn from this flower. Just as it will lean out as far and as low as it needs to reach sunlight, we also need to be diligent to reach out looking for the Son and turn our faces toward the Sonlight. We need to stretch ourselves to the max so that we can gain all the benefits of being in the Light, SO THAT, we can be light for others to see, strong and healthy. We want to stand tall and stand firm with renewed life. Oh yes, just like the daffodil, we might need the help of a friend to support us at times, but that is what God has placed people in our lives to do. It is what our relationship with Him and His Word is about also. So, stretch yourself as far as you can reach, lean out with head to the ground if you need to, and let the Sonlight shine down on you and give you renewed hope and joy! Be a seeker of Light! And then…shine on! Previous postWhat Will Make You Quit? Next postWho Likes Detours? I Do!